Using our Coin Top Interlocking floor tiles is a great way to improve the look of any garage floor, commercial display floor, trade show floor, or any hard surface flooring. These floor tiles are available in multiple colors to allow checkerboard patterns or other designs. The tiles are comprised of a non-toxic, high-impact polymer (non-rubber), which is a rigid, lightweight and strong material. The rigidity of the material allows the garage floor tiles to be designed with a grid on the bottom side that permits air and water passage. 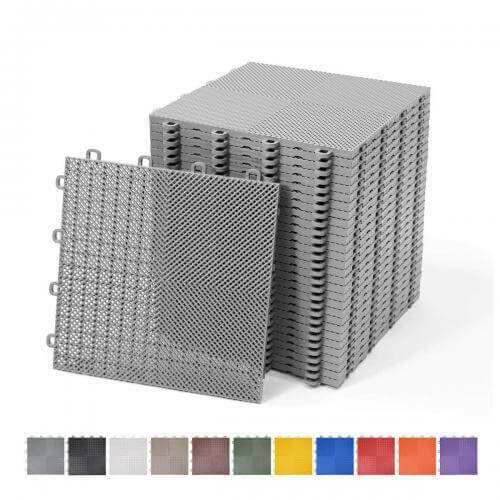 This grid feature prevents moisture from becoming trapped under the tiles. Petroleum products such as grease, oil, antifreeze or most household chemicals do not easily affect the floor tiles. Cleaning the tiles is simple. Just wipe them clean with a sponge mop using a mild soap and water. 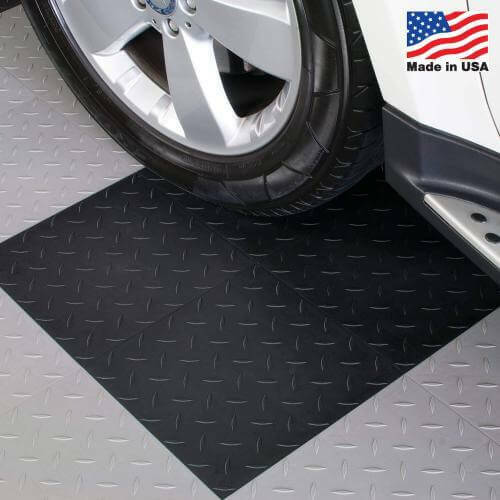 These interlocking floor tiles can withstand heavy foot traffic and heavy rollover weight of large vehicles including SUVs and pickup trucks. This makes the tiles especially suitable as a garage flooring solution. There is no surface preparation needed other than sweeping the garage floor clean. Although the tiles are constructed of a rigid material, it is okay to use in slightly uneven solid surfaces. 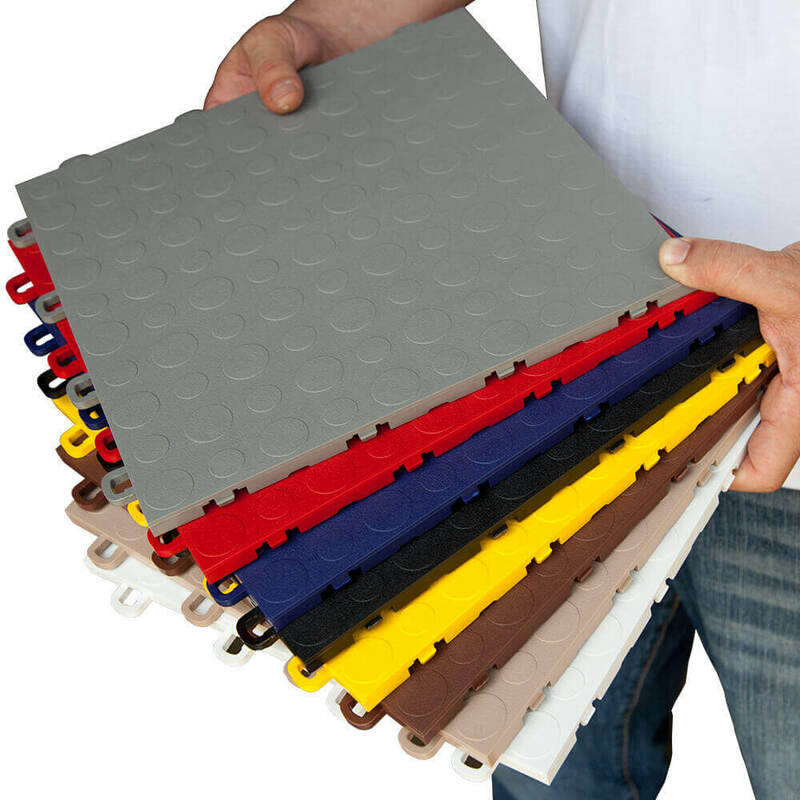 Installation of these tiles is very simple because no special tools are required. 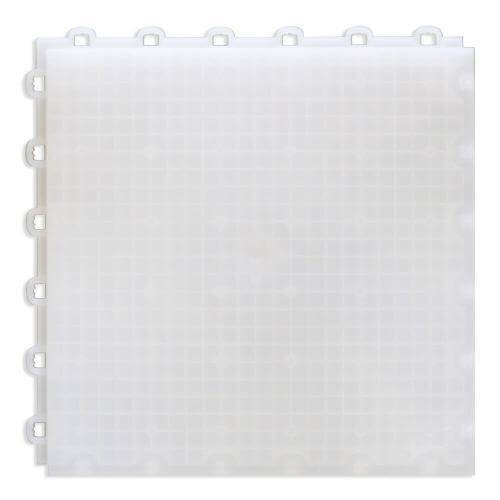 They interlock together with a loop-to-peg system to create a “floating floor.” When installing the tiles, it is important to leave a 1/2-inch gap minimum around permanent objects to prevent buckling. We put this in a cement floored storage room. It looks wonderful and gives us a nice finished surface that won’t be affected by moisture or use. We combined the perforated tile with the coin tile. We are very happy with it! Durable, easy to clean! 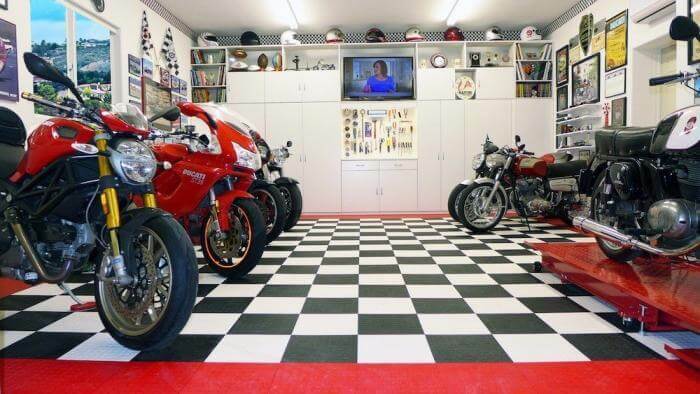 I have tried the epoxy for my garage floor twice, once I did the second time I had it done. The high desert heat just pulls the paint off the floor. The flooring was so easy to I stall and looks great. Easy to clean up also. Makes noise when I walk on it is my only complaint. Hunted and researched far and wide before I decided on this product. Been in place for about 3 weeks and am happy with it. Positives: Looks great, easy to install, easy to clean, can install in stages so you don’t have to clear the whole garage out at the same time, Sam’s price is outstanding, not noisy when I walk on it even though some people complained about it, can pick it back up if I change my mind. Cons: Gets dirty quickly(looks so good you just notice stuff you wouldn’t on concrete), dull finish. All my neighbors think it is super cool. It does look way better than any epoxy paint, rubber matts, or roll up sheets I’ve seen. I used a concrete sealer underneath. Used a large rubber mallet to lock tiles, it was easier for me than stepping on them. Watched a couple of videos and read instructions, very easy to install and to break apart when I made mistakes. Used a Rockwell cutter(small circular saw) to trim tiles. Small tabs on the edges made it difficult to line up edges on the compound mitre saw, cutter worked much better. You will probably notice the wall lines and concrete work in your garage are neither very straight nor very square. Took 2 days to install 700sf including trimming, cutting and the time it took to move all my garbage back and forth around in the garage. Side point: Used RaceDeck sticky back diamond finish tiles for a raised step. These have a shiny finish that looks amazing and doesn’t show the dirt as bad. Wish I could have used these instead, but the concrete underneath must be VERY flat with no expansion joints, seams, or raised areas. Would have taken way too much work to prep the concrete. One and a half year ago I installed this floor in a two stall garage in Tuntra Land, Wisconsin. Prior to this i had a semi-epoxy painted floor. I installed this floor myself in a little over a day (I am 75+ years old) It has gone throught two winters. I just washed (rinsed) it out for the second time. By just rinsing it with like warm water it comes back to almost new. A little later this spring I will wash it with a little soap and my floor scrubber. Car tracks do not show. Nothing sticks to it. Oil spots can be wiped up with a little gasoline. If you damage a tile, you can replace it. En excellent product and Walmart is the place to buy it.